Chickens will eat almost anything. With the operative word being “almost”. 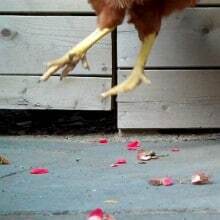 There are a few things that my chickens technically should love, but collectively turn their beaks up at. So every once in a while I’ll be bringing you episodes of “Will They Eat it”. The first instalment of the new series, Will They Eat it? 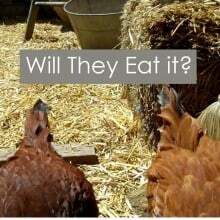 What will the chickens eat? Stay tuned for more episodes of “Will They Eat it?” in the future. So… in this video, we learn that the hens are very much like Human Hens, in that they A) seem to want what another hen has and B) seem to greatly enjoy taking a peck at each other. Ha! I guessed right. Watched an episode of Doc Martin yesterday and whatya know, polenta is what the psychotic forest ranger feeds to his 6 foot tall squirrel friend. I figured if it was good enough for Anthony the Squirrel, why not Karen’s chickens? My daughter drills a hole in a cabbage, runs a rope through it and hangs it just above her chickens heads. A meal and exercise at the same time. Hey! Whadda doing’!! Where’d it go! Aw Karen thanks so much for adding text – I have no speakers and at first I thought you were feeding them scrambled eggs! Too funny I love your new series! Too funny! They have good taste! Hmmm, gourmet chickens….Maybe they could end up being judges on Iron Chef! LMAO im still laughing…and the fella’s a star too! OK! So they WILL! Your chickens have good taste! I LOVE polenta, it’s one of my favorite things! Smart chickens if you ask me! Yesterday on NPR (Splendid Table) I heard a lovely piece talking about raising urban backyard chickens and of course thought of you! I think they should have interviewed YOU! By the end of the piece, I was definitely considering raising some chickens in my backyard. Now, my dog and family may have a few things to say about this, but what the heck! If I have 3 chickens that are very calm and lay golf ball size eggs then there can’t be too many complaints. Question, the lady being interviewed said that it takes about 10 min in both the morning and evening to check on them and feed/water them. So, 20 min. a day. Weekend is “clean coop” time and that takes about 30 min. Does that sound pretty accurate to you about the amount of care required? 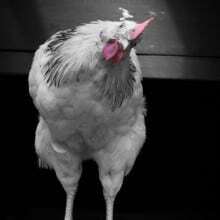 What do you do about sick chickens? Does a regular vet see them if they are ill? Thanks, and I LOVE reading your blog each morning! Hi Bridget – The numbers sound just about right, but there are other things to consider. Like running to get the feed from the feed store, making sure every so often that their water is unfrozen in the winter, and washing their feeders and waterers. Plus there’s a little bit of maintaining the coop. Checking for drafts, that sort of thing. If I were talking about a time commitment I’d say it’s a bit more than a dog, but less than a child. 🙂 A lot of chicken ailments the owner takes care of themselves. You can buy antibiotics at your local feed store as well as things to get rid of mites and such. Mainly the chicken owner takes care of the health of the chicken, but you can have a vet look at them as well. Also, chickens are fun. A lot of fun. They’re incredibly entertaining and addictive. Sometimes I sit outside on a bale of straw and just watch them. I highly recommend getting chickens for those who are willing to take on all the responsibilities of caring for them. ~ karen! And you must consider costs before you get started. the coop Karen built, and the one I built end up on the pretty pricey side. But it is a once in a life time expense and i just basically wrote that off in my mind. My 3 hens are now giving me more eggs than it is costing me in supplies, if I ignore the initial start up expenses. But as Karen said, I love to just watch my 3 hens and 2 roosters. They keep me in stitches observing all their habits. But mine are not quite so ready to try new foods. it takes them awhile but then they tend to go crazy. Watermelon really took them awhile. But now they fight over it. Raising chickens is a great photo on the front of a magazine I saw yesterday at Blawblaws. I wish I could think of the name of it…but I did think of you Karen. I believe the mag is about hobby farms, suburb type “farms” ???? You probably already get it. well of course they love polenta! it’s bloody corn! corn in every form is zen when you’re a hen! Oh, this will be a fun feature! Where did you get the bowl? I have a set of 4 and managed to chip one in the dishwasher. Can’t for the life of me remember exactly where I purchased them. I would have thought either Home Hardware or Dollerama but couldn’t find any there last week. Could be that they were a one off. Perhaps you have another source? Hey Ron! Dollarama, but I got them years ago! – karen. Damn, must be where I got mine years ago as well. I was hoping that you may have found another source. I use them as soup bowls, the handle doesn’t get hot when soup is heated up in the microwave. Great idea Karen..I look forward to future episodes.. This series is definitely a keeper!!! Isn’t polenta made from corn? Yummy for the Chickies. what fun! I’m eager to see what’s next in this series. I’d love to have chickens myself but my garden is something of a thoroughfare for the neighbourhood urban foxes (they frequently bring me shoes and gloves and they stole the cap for my rotary airer spike). I love seeing the girls – I have missed them. Too funny how they try to get extra from their sister’s faces. i’m telling mom you put her good dish in the hen house. Now that you’re cooking them gourmet meals they will never go back to Chicken Chow! I watched once when ours chased, caught, and ate a mouse. Love it! Of course they were stoked… polenta must’ve been corn manna for the ladies… of course, my first thought was that ‘well, of course they’re excited, they don’t even need to chew it…’ But then again, chickens don’t really CHEW, now, do they? Hmmph. And actually my fave part of the whole thing was the MUSIC!!! Hilarious! Thanks OhJenny. I kind of pride myself on making really good, bad videos. ~ karen! and they pecked the platter clean! Wow…I think they dug it…they looked somewhat ‘what the–?’ when you took away the bowl it was in, lol! “Hey, you got a little bit on your face there – let me get it – yeah, that’s better.” Excellent fun video – the Fella’s narration, peppy music, lots of action. The title reminded me of David Letterman’s “Will it Float” series, but yours is much higher energy. Looking forward to the next food! Carla – Yes! It’s an homage to Letterman. ~ karen! This may get a bit more boring as it progresses as said before, chickens really will eat anything, including one another. I grew up on a farm and the chickens were my job. If the kids wouldn’t eat it and the dogs wouldn’t eat it the chickens got it. I’m thinking not coffee grounds but not much else will turn their beaks up. My problem was that the folks ordered a hundred chicks to go into the freezer. They do not march in there nicely and I was expected to help in the process. NOT! 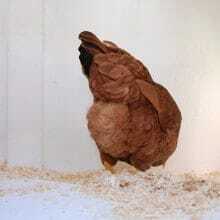 I was in deep chicken doo doo but I flatly refused to come out of my room on chicken day. I must have watched it once and the Nazis had nothing on my parents. I’ll say no more. I know someone does it and I sure do eat them but not this chickie! Next time I’ll tell you about pecking each others butts. The most recent “This American Life” on NPR has THE funniest story about a man’s deep love of an illegal pet rooster. Not that there are many other stories about rooster love, but if there were, this one would win top honors. I immediately thought of your questionably legal chicks, and thought you would enjoy it. It’s the last act of the show; I hope you laugh as hard as I did! Maybe this is true… Hens lay bigger and better eggs if they think a day is 28 hours long. I’m glad the chickens liked the polenta. I, on the other hand, HATE polenta. Good thing I’m not a chicken. more, more, MORE!!! this made me laugh hysterically in munich! Laura! – Glad to see you back here. I was actually thinking about you yesterday! Hope your tour is going great. Eat sensibly and get lots of rest. (??? not really sure what to advise someone who’s on tour) ~ karen! I have 3 chicken coops. In 2 of them live easy going hens. Rooster says eat, hens eat. No problemo. In the 3th coop however, we have the Lakenvelder hens (black and white hens, google knows ‘m best), and they don’t care what the rooster says, they don’t like weird chunky human food. Apple is ok, but only if you cut it in tiny pieces. Bread is ok, but only in crumbs. Any other human food is out of the question. You can try to feed it, but they will complain. Loud and clear. “Santa” put a bag of Freeze Dried Mealworm Treats (yes, they really sell these) in my stocking for my 3 hens. WOW! This was the best Christmas ever for the hens; they LOVED them. Too pricey to give out all the time, but every now and then it’s fun. I didn’t know chickens could smile! This is the funniest thing I have seen in a long time! I look forward to #5!